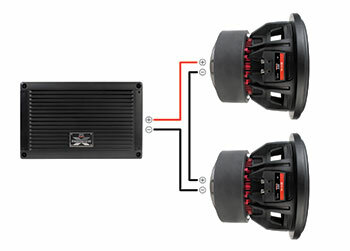 A primary factor in choosing component car subwoofers is choosing the correct amplifier to power the system. If you wire one subwoofer to one amplifier, your matching calculation is straight forward. But if you are wiring multiple subwoofers to a single amplifier, then calculating the total effective impedance of the system is a necessary step for safety and reliability as well as performance. Generally speaking, parallel wiring is where the positive terminals of the source and all loads are wired from one to the next, and the same with the negative terminals forming two loops. Generally speaking, series wiring is where the positive terminal of the source is wired to the positive of the first load, the negative of the first load is wired to the positive of the second load, and so on. The negative of the last load is wired back to the negative of the source forming one large loop. Ohms are a measure of impedance, or impedance to electrical current flow. A larger Ohm rating equals a greater load impedance. A higher impedance load will result in less amplifier output for that impedance, for example an amplifier will output more power at 2 ohms than at 4 ohms. Amps can generally be safely wired at 4 or 2 ohms and some even at 1 ohm depending on their design. If you have an amplifier wired to a single-voice-coil (SVC) subwoofer, there is only one wiring method, so the SVC impedance is what the amplifier must match. But if your sub has a dual voice coil (DVC), or you are wiring multiple subwoofers to one amplifier, then understanding the wiring alternatives offers insight into how best to connect them to maximize performance. The goal is to deliver as close to rated power to each sub as possible with a given amplifier by wiring the system in a manner that minimizes the effective impedance without exceeding the power rating of the subwoofers. You may occasionally need to compromise. For instance, some subwoofer/amplifier combinations will not allow full power to be produced safely such as a sub combination that results in a 1 ohm effective load for an amplifier rated at 2 ohms minimum. Instead of burning up your amp, you may be able to wire the combination to result in a total impedance over the 2 ohms so that while the amp will not deliver the full power rating of the subwoofer (and your SPL will be lower), at least the amp will operate safely and reliably. Since multiple subwoofers wired in combination result in different effective impedance ratings as a group total, we must calculate this total based on our wiring technique. In reverse, we may be able to change our wiring pattern to accomplish needed impedance totals to match the component combinations we desire. In series wiring, you add the impedances of the voice coils, so wiring two 4 ohm voice coil subs would result in 8 ohms for the system total as presented to the amplifier. While series wiring of multiple subs increases the total effective impedance, parallel wiring of multiple loads lowers the total effective impedance. With subwoofers rated at equal impedances, the system impedance is equal to the impedance of one sub voice coil divided by the number of subs. So if you have two 4 ohms subs wired in parallel, the system would have an effective impedance of 4 ohms divided by 2 subs for a total impedance of 2 ohms presented to the amp. Since parallel wiring lowers impedance, always double check to ensure your totals do not run into unsafe levels especially when bridging an amp to increase the rated power available. Bob has a great single sub system in his Chevy, but wants to upgrade to two subwoofers. He currently has an MTX THUNDER500.1 500W RMS mono block class D amplifier with one MTX 3512-04 12" 250W RMS 4 Ohm Subwoofer. Can he add another 3512 subwoofer? The amplifier is rated at 300 Watts RMS x 1 Channel at 4 Ohms or 500 Watts RMS x 1 Channel at 2 ohms. Since it has been wired to a single 4-ohm sub, the amp can deliver 250 watts with a properly set gain to match the sub power rating perfectly. Ideally, Bob want's 2 x 250 watts = 500 watts for the two subs. From the formula above, we see that we can lower the total impedance of the two sub system if we wire in parallel. So we take the 4 ohm impedance and divide by two subs, which results in 2 ohms total impedance. This amplifier can deliver 500 watts at 2 ohms, so each of the 3512s will get their full 250 watts of optimum power. This means we are going to rock big time! What if Bob wanted to use that same amplifier with a couple new 55 Series subs which have a dual voice coil design and can handle 400W RMS. Can he do it with this amp? The rating on the amp is 300W x 1 channel @ 4 ohms and 500W x 1 channel @ 2 ohms. The 55 Series subs are dual voice coil so the wiring is going to be different than our previous example. If Bob were to use two 5512-44 subwoofers they could be wired at either 4 ohms or 1 ohm, which would not be enough power at 4 ohms and at 1 ohm would cause damage to the amplifier. If he chose two 5512-22 models, they could be wired at either 2 ohms or 0.5 ohm. The 2 ohm wiring would allow them to work with the amplifier and although the system would not get the full power out of the subwoofers, 800 watts, the system would function and deliver excellent SPL performance.